The Grand Canal Innovation District is an initiative whose time has come. We can’t just repeat the existing formula, we need to keep adapting. Ireland must deepen its relationship with the many innovative multinationals that have located here, and develop stronger links between them and the regions in which they reside. What will an Innovation District achieve? An innovation district will connect indigenous and multinational companies together with researchers and venture capitalists. Such a district will produce a sum that is greater than its parts, driving inward investment, new collaborations and jobs. Its benefits will be brought to the regions through virtual connections and the sharing of research, best practice and space. This district is not just a business park, but a place for cultural institutions and amenities for the community, a place where everybody, whether office worker, tourist or local resident will want to spend time. 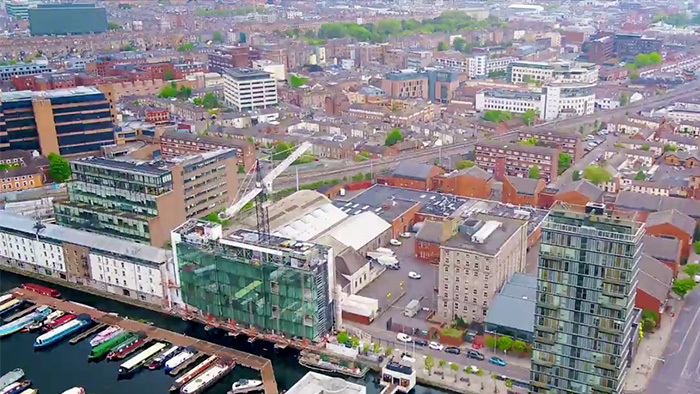 In March 2019, Diarmuid O’Brien, Trinity’s Chief Innovation Officer, spoke about the Grand Canal Innovation District vision as part of a panel session at the American Chamber of Commerce’s Conference. He was joined by Dennis Lower, President & CEO of Cortex Innovation Community (a large innovation district in St Louis, Missouri); Tim Rowe, Founder and CEO of Cambridge Innovation Centre (CIC), an organisation that provides flexible co-working spaces and coordinates events to bring innovators, investors and researchers together, and Carrie Allen, Executive Director for CIC Captains of Innovation. A Vision For Ireland (PDF) We aim to make Ireland the tech capital of Europe and we have many of the ingredients to succeed. The evidence is all around us as we see so many high-tech companies located here. Manifesto (PDF) Outlines our vision and serves as a call to action for industry; higher education and government to collaborate on a new and critically important engine of growth for Ireland.